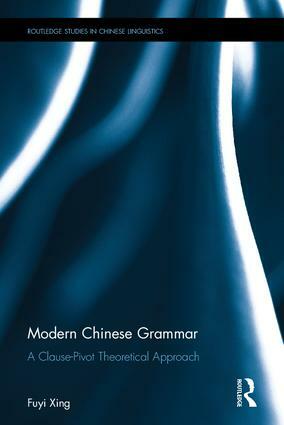 Modern Chinese Grammar provides a comprehensive coverage of Chinese grammar through the clause-pivot theory and the double triangle approach, first proposed by Fuyi Xing in 1996. Translated into English for the first time, the book is widely regarded by linguists as a seminal text, and ground-breaking in linguistics research. The book contains discussion of the topics which are essential to Chinese grammar, from words and phrases, to complex sentences and sentence groups. It addresses such controversial issues as word class identification, the distinction between words and phrases, and between clauses and complex sentences. The book also shows, through a wealth of examples, how the clause-pivot theory and the double triangle approach can be applied productively in grammatical studies. Modern Chinese Grammar: A Clause-Pivot Theoretical Approach is an essential purchase for researchers and graduate students of Chinese grammar and syntax. Fuyi Xing has won many prizes and honours for his contribution to the study of Chinese grammar in China. His influence is felt internationally, and he is recognized as the founder to logic-oriented Chinese grammar in Russia, and as one of the most important Chinese grammarians of the 20th century in China. Yong Wang is a professor at the Department of English Language and Literature, Central China Normal University, China. Fangfeng Dong is a professor in the School of Foreign Languages, Central China Normal University, China. Routledge Studies in Chinese Linguistics is a state-of-the-art book series showcasing high quality research on the linguistics of the Chinese language. Titles in the series range from seminal classics to cutting edge studies in the field, and comprise both research monographs and edited volumes. Contributions are welcomed from all areas of linguistic study applied to the Chinese language, including but not limited to phonetics, phonology, morphology, syntax, semantics, pragmatics, discourse analysis, stylistics, sociolinguistics, language and communication, historical linguistics, dialectology, language acquisition, language pedagogy, corpus linguistics, bilingualism and Chinese for specific purposes, etc. Published in English, titles in the series will be of great interest to postgraduate students and scholars in the fields of Chinese language and linguistics. If you have a book proposal or idea in mind that might be suitable for the series, please contact the series editor Hongming Zhang of the University of Wisconsin-Madison (hzhang6@wisc.edu). For more information on submitting a proposal to Routledge, please visit http://www.routledge.com/info/authors/#submitproposal.